A First World War memorial plaque has been unearthed in a garden in Liverpool. The plaque was formerly in St Peter’s Church in the Toxteth area of the city and was found in the garden of its former caretaker. Several of the names on it are not recorded in the city’s Hall of Remembrance. Liverpool Lord Mayor Gary Millar said the discovery would allow the men listed to ‘take their rightful place in the history books’. 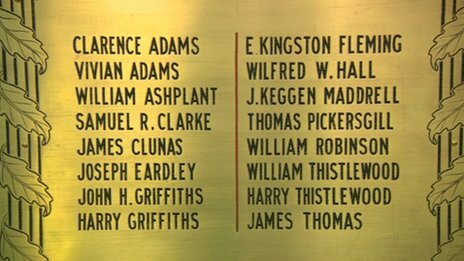 The plaque lists 16 men, five of whom – William Ashplant, Samuel R Clarke, James Clunas, Harry Thistlewood and E Kingston Fleming – were not included in the hall, which honours those who died in two world wars. It is believed the plaque was taken from the church for safekeeping some time before 2007, when the church and its land were sold to make way for residential properties. Millar said he wanted the families of the men to come forward and claim their relatives’ place in the hall. This entry was posted in Events and tagged Centenary of the First World War, CWGC, Liverpool, Liverpool Lord Mayor Gary Millar, memorials, news, Soldiers of the Great War, Toxteth, UK News, WW1. Bookmark the permalink.